Saif Ali Khan is all set to star in Jay Shewakramani's next film is titled Jawani Janeman. Jay Shewakramani announced Saif Ali Khan's association with the film by sharing the news on social media on Wednesday. He shared a picture of himself along with Saif on his Instagarm account profile and wrote:" New venture partners." He accompanied the post along with hashtags such as "#Friendsforever" and "#jawanijaneman." Talking of casting Saif in his next project, Jay said in a statement,"Saif and I have always chatted about producing films together. We were on the lookout for the right script and with Jawani Janeman we found that," stated news agency PTI. The film will be directed by Nitin Kakkar. 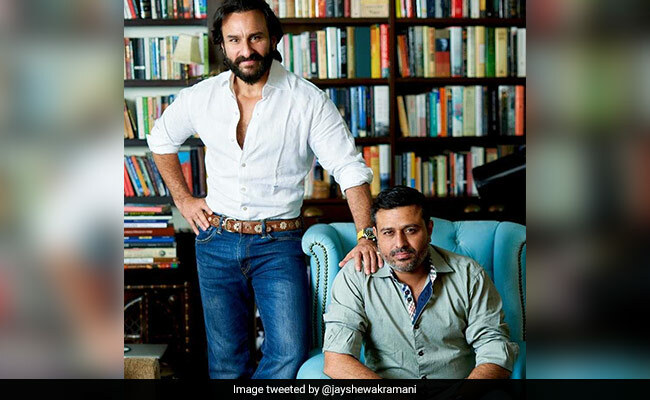 Jawani Janeman will collaboratively be produced by Saif Ali Khan's production house Black Knight Films and Jay Shewakramani's Northern Lights Films. The film is expected to go on floors next year. The film will reportedly be a comedy-drama, in which Saif Ali Khan will be seen playing the role of a father. However, the actress who will be seen playing Saif's daughter in the film hasn't been finalized as of now. Jawani Janeman will mark Saif Ali Khan's third collaboration with Jay Shewakramani. The duo have earlier worked together in films such as Race and Race 2. On the work front, Saif Ali Khan was last seen Netflix's web-series Sacred Games. He currently awaits the release of his next film Gauravv K Chawla's Baazaar, in which he will be seen playing the role of a an ambitious business tycoon named Shakun Kothari.